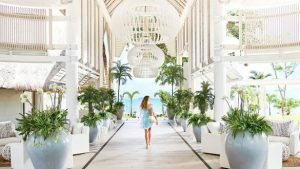 LUX* Grand Gaube on the northern coast of Mauritius has officially re-opened this month and welcomed its first guests in eclectic, retro-chic style. Glide into the spacious lobby and be greeted by staggering ocean views. With a simple yet refined design style and considered comfort throughout the resort, British interior designer Kelly Hoppen and Mauritian architect Jean-Francois Adam have achieved their vision of contemporary yet timeless Indian Ocean living. All 186 rooms, including 89 suites and villas open to stunning sea views and airy verandas, some with outdoor baths or sundecks edged by the resort’s private cove. LUX* Sleeptight mattresses and the highest quality refined Egyptian cotton linens ensure extreme comfort and the best night’s sleep. Huge doors treat the living spaces to lots of natural light and the generous dressing space enhances the loft-style feel. Spindrift-white bedrooms are enhanced with unexpected home-from-home touches, such as succulents in ceramic pots. Handwoven African baskets, wicker tables and smooth floors ensure all bedrooms are as comfortable as can be. Geometric encaustic tiles add graphic-design personality to ensuites, and many bathrooms have reclaimed bespoke Victorian bathtubs. The top-level accommodation is the signature two-bedroom LUX* Villa, which sleeps a family of four in a beautiful blend of original, modern styling and classic retro chic. The resort is home to six restaurants, seven bars with some dining concepts a first in Mauritius. Enjoy sunshine or starlight through the glazed ceilings of Palm Court Restaurant and feel the gentle lagoon breeze. Savour dishes cooked à la minute with seven live-cooking stations scattered throughout the foliage-filled dining room. Every table has a knock-out ocean view, with seating on cosy banquettes and at kitchen counters. Be it breakfast or dinner, guests are spoilt for choice to satisfy their wildest cravings. The interactive open kitchen at the heart of Palm Court means guests can choose between favourite comfort foods or theatrical teppanyaki creations – it’s all there for the taking in one sitting. Stick to healthy eating intentions with ease thanks to an award-winning team of chefs carefully sourcing the best nourishing ingredients — help-yourself salads, just-made sushi, house-made kombucha elixirs, gourmet smoked fish and cured meats await. Take your senses to Asia for zingy curries, tandoor-baked naan breads and Sichuan or Cantonese stir-fries made right there. There’s home style Italian cooking too, including wood-fired pizzas, salt-crusted fish, crispy suckling pig and a rotisserie showcasing the juiciest cuts. INTI, the first Argentinian-Peruvian restaurant in Mauritius throbs to Latin American music from late afternoon onwards — as dreamy for sundowners as after-dinner drinks. Atmospheric and inspired, a DJ soundtracks the Ceviche and Pisco Bar, while seafood and cocktails specialities are expertly prepared to whet your appetite for dinner in the lagoon-side garden. As a tribute to LUX*’s award-winning resort in Turkey, the Bodrum Blue at LUX* Grand Gaube serves seafood fresh from the Indian Ocean with excellent Turkish wines. The selection and variety of dishes inspired by Bodrum’s coastline have been prepared to perfection thanks to Bodrum’s Blue Turkish chef. Five Turkish wines have joined our Scrucap collection and they are only available at Bodrum Blue. Over in the dedicated adults-only Banyan Area, inventive cocktails from 88 varieties of rum flow all day from the Rum Tree House and traditional local dishes cooked on wood and charcoal are served up from the Creole Smokehouse. Or quench your thirst on cocktails and refreshments care of the quirky, vintage Citroën H van aptly christened “French Kiss”. The Wellness area is a haven for those needing relaxation, to be beautified, or to tone up with a workout. Aromatherapy experiences await with LUX* Me’s therapies from Shirley Page. The exclusive Cellulight body oil treatment and the Enlightened Woman treatment rebalance natural rhythms and soothe mothers-to-be. Carita Haute Beauté in Paris brings its prestigious high-performance anti-aging skincare and regenerating treatments combining micro-current, ultrasound and LED technologies. The first resort in Mauritius, to have an Essie nail bar and also an authentic barber’s shop – take a bow, Murdock’s of London which offers a signature wet shave, beard and moustache trimming service in style. A specialised health programme is available thanks to Kamran Bedi of Mind Body Method, an NLP master practitioner (neuro-linguistic programming), hypnotherapist, meditation teacher and Pilates instructor. Guided meditation and stretch-based classes assist the body in releasing tension, barre-style workouts and a new Pilates practice, while Movement On The Roller works on the whole body, promoting balance and mindfulness. Art and soul abounds thanks to the talents of London-based French artist Camille Walala, who has created a stunning pop-style artwork at Beach Rouge. There are imaginative Gouzou graffitis too, hidden around the resort, painted by French street-artist, Jace. Go Gouzou-spotting as you search for the witty hand-painted illustrations, which have a cult following across Europe, Africa, China and the Indian Ocean. The resort also features a dedicated kids and teens club with programs ranging from movie screenings in a private 60 seat cinema, Indian and Creole fashion shows, cake decorating, fishing lessons, treasure hunts, yoga initiations, pedalo competitions and more. In line with the fresh new look comes a brand new set of Reasons to Go LUX* including Padel Tennis, the G&T 100 Club, Veggie Heaven and Beach Bento Boxes awaiting guests. These add to the already celebrated Café LUX*, ICI, Phone Home, Cinema Paradiso, Scrucap, Mama Aroma, Message in a Bottle, Phone Home, LUX* Me, Tree of Wishes, Tread Lightly, Junk Art Gallery, Aperitivo, Panama Hat, Photofanatics and Wanderlust Library.